Hoary bats (Lasiurus cinereus) are a tree-roosting bat species known to migrate long distances from their summer range to winter range. In the summer, hoary bats are found widely across the northern United States and southern Canada. Coastal California is considered to be the core of the species winter range, especially for individuals from western North America. The nocturnal activity patterns, cryptic roosting, and migratory behavior of hoary bats pose challenges to their study and has left open questions regarding this species’ life history, temporal thermoregulation, and roost selection strategies. Few hoary bats have been captured or observed at any location during the months of November to April. The extent of winter range has not been clearly defined, nor has their preferred winter roosting habitat. 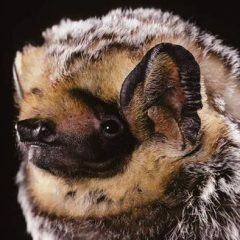 Since 2010, hoary bats have been reliably captured in Humboldt Redwoods State Park during the autumn and spring suggesting they may occupy this watershed during the winter, entering torpor during spells of colder weather (i.e., hibernate). A study using GPS transmitters and data loggers that recorded temperature, light levels, and relative activity observed hoary bats captured in this area displaying a wide-ranging variety of winter behaviors including 1) covering a longitudinal migration path of >1000 km during October and returning to the capture area 2) traveling up to 68km during a single night 3) and several individuals that stayed within the watershed into the winter season. In this study we are using long-duration radio transmitters to model seasonal residency period and roost selection of hoary bats in redwood forests fall to spring. Using “connectivity” radio-transmitters that can last up to seven months, a stationary data-logging radio receiver, and mobile tracking, we hope to establish roost selection characteristics. This study may also provide insight for migrational patterns and thermoregulatory strategies and help to establish the importance of redwood forest refugia to sustaining this species.